The color of EDO, Yamasa's red. Black and red. Plain vanilla soy sauce and delicious soy sauce. The difference lies in Yamasa Aspergillus, a distinctive type of koji mold that has been passed down from the day of establishment of the company in 1645. 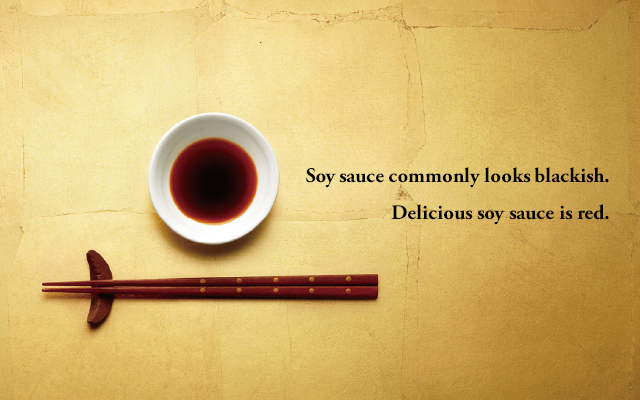 Naturally brewed soy sauce is made from soybeans, wheat and salt. Yamasa soy sauce is simply the result of fermentation of these raw materials, owing a great deal to the action of Yamasa Aspergillus. Well-known and chosen among professional chefs of Japanese cuisine, because of its unique aroma, flavor and color. Delicious soy sauce can be distinguished just by looking at. It looks not just blackish brown but translucent reddish brown. Being particular about quality of soy sauce, the absolute best is red soy sauce. Please see the Yamasa soy sauce of commercial movies. This large cask was sleeping deep inside the cellar house. This cedar cradle used to cultivate and mature soy sauce in those days. The soy sauce brewed in the cask was shipped to the city of Edo, a centre of graceful food culture during the Edo period when universal peace was maintained in Japan. Sushi, Tempura and Kabayaki grilled fish. These were also created and established during the Edo period. Yamasa soy sauce was featuring here and there in the kitchens where chefs showed their cooking skills. Unique aroma, flavor and color are the result of Yamasa Aspergillus. The spirit of Yamasa brought alongside Japanese cuisine since the Edo period. Quality of Yamasa soy sauce highly evaluated by Japanese cuisine professionals.